As the nation-state of Canada approaches its 150th anniversary in 2017, it is increasingly important for its citizens to have a greater understanding of the fundamental role played by First Peoples in its development. This is the tone currently being explored by Zakide on various other projects and it should be stated that Zakide brings the challenging of context to everything we do. “Craft” is the term used by a wide group of people and is a self-identified term. We want to bring the craft world into our world, which deals primarily with Aboriginal arts rights and statements of sovereignty. 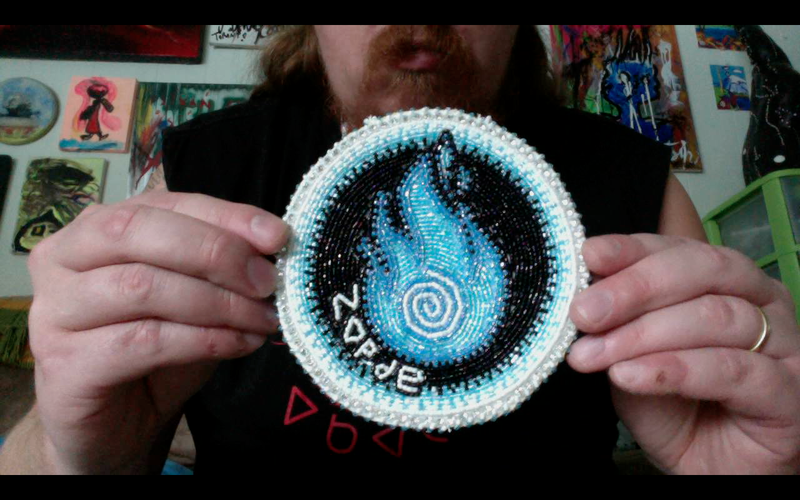 Tasheena Sarazin made this exceptional medallion for Zakide member Clayton Windatt as a commission. Zakide is exploring different designs and creation ideas so that we can honour influential artists and make strong connections with community leaders. Thank you Tasheena for this design, we are looking forward to working with you further in the future. Tasheena Sarazin is a multi-award winning Algonquin Pow Wow singer, songwriter, fabric artist, jewelery maker, and traditional bead worker from Golden Lake First Nation. Her artistic skills and colourful intricate designs have been influenced by her mother her who taught her how to be resourceful and live by her traditional cultural values. Tasheena grew up singing and dancing in Pow Wows and has always been an active force in her native community including being a part of the student council for youth groups across Ontario. In 2010 she sang backup for the drum group White Tail Cree on their album entitled ‘Indian Days’. She was also the opening act for A Tribe Called Red’s ‘Rez Tour’ this past summer for their Moosefactory performance. Now a mother of 3 young boys, Tasheena works as a dance, voice, and cultural teacher within the Near North District School Board and as a community-engaged artist at Big Medicine Studio. Tasheena has performed in Aanmitaagzi’s ‘People of the Ice’ as a part of Ice Follies 2014 as a vocalist and in their 2014 premiere of ‘Dances of Resistance’. She has also recorded with musical composer Edgardo Mereno and continues to work on completing an album of her own.